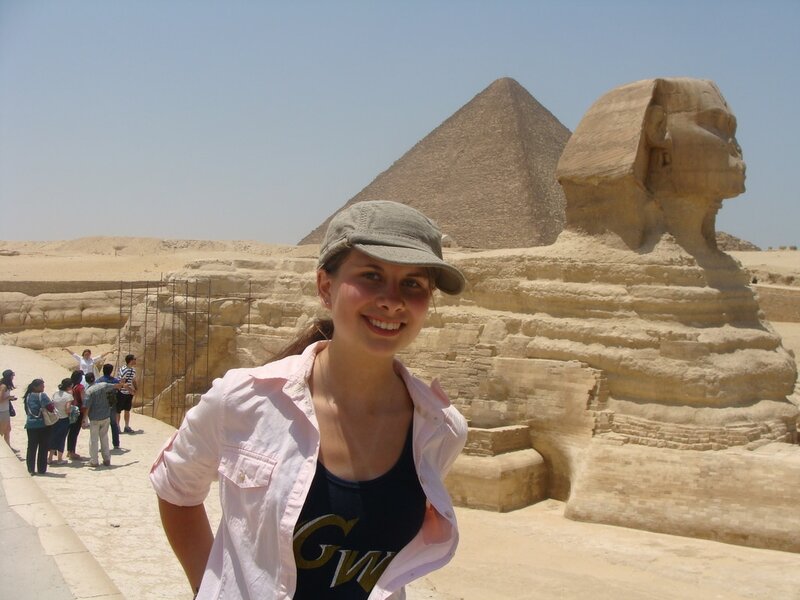 Explore the three pyramids and the Great Sphinx in the Giza pyramid complex. 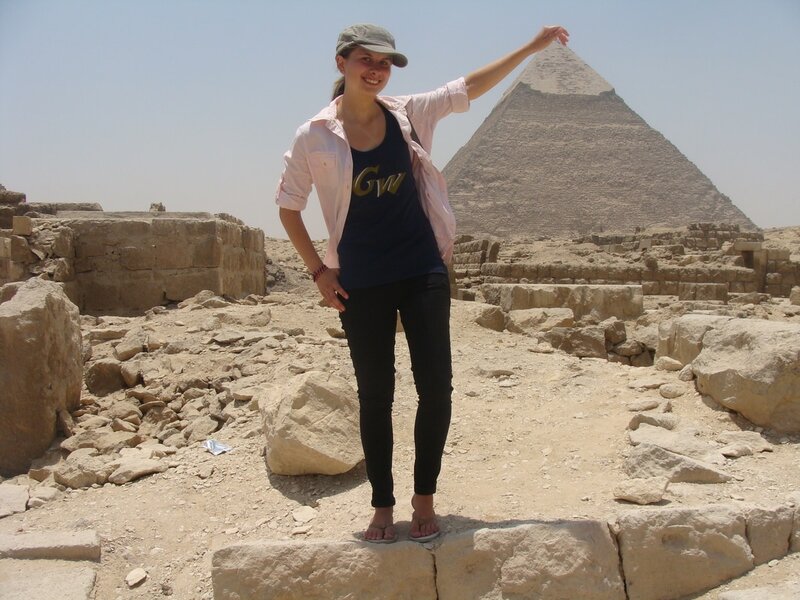 If you've come to Egpyt, it's likely your first stop will be the pyramids. While many tourists believe that the pyramids are located in Cairo, they're actually found in the outskirts of the capital, in the city in Giza. The pyramid complex almost appears to emerge out of the city streets as paved streets and desert terrain suddenly come together in a mix of old and new. The pyramid complex consists of the Great Pyramid of Giza (or Khufu), the Pyramid of Khafre, and the Pyramid of Menkaure. The Great Sphinx - which is believed to represent Pharaoh Kafre - resides in the east side of the complex. ​While you're visiting the attractions, numerous vendors will attempt to sell you inexpensive souvenirs, offer to take your picture for a small fee, or try to take you on camel rides around the pyramid complex. Politely decline or take them up on the offer - as seen below, the pictures can turn out quite nice! Tour the Egyptian Museum in Cairo. Formally known as the Museum of Egyptian Antiquities, this museum has an impressive collection of ancient Egyptian artifacts, ranging from the famous Gold Mask of Tutankhamun to mummy masks and delicate figurines. The entrance fee for foreigners is roughly $3.50 (60 Egpytian pounds). Take a boat ride along the Nile River at nighttime. The river front in Cairo is lined with boats ready to take tourists and locals for a ride. For only a few dollars, hop on one of the boats and enjoy the music and cool nighttime breeze. Enjoy sweeping panoramic views of the city from the top of the Cairo Tower. As the tallest structure in Northern Africa, the Cairo Tower is worth a visit. The entrance fee is roughly $3.50 (60 Egyptian pounds). Visit the Mosque of Muhammad Ali. Cairo is known as the "City of a Thousand Minarets" due to the large number of mosques throughout the city. While the Mosque of Muhammad Ali is not one of the most ancient mosques, its location in the Citadel of Cairo makes it a prominent landmark. Mosque and Culture Etiquette - If you're a woman, ensure that you wear a headscarf around and inside of the mosque. Exposing shoulders, arms, and legs must be avoided. Men should also dress modestly by wearing long pants and covering their shoulders. Mosques will reject those that are inappropriately dressed or offer a type of covering that you must wear to be allowed entry. Take a walking tour through Cairo. Most tourists that come to Egypt stick with a tour group. If you want to get off the beaten path, try walking around the city and exploring ancient mosques, minarets, street stalls, and shops. If you're a woman, I recommend wearing a headscarf and traveling with a companion. It's relatively uncommon to see foreigners walking around alone. As always, be aware of your surroundings.